​Our Goat Milk Kefir is made with our freshly pasteurized goat milk and Kefir cultures which is gently stirred and left to sit at room temperature much like yogurt for a few days while the cultures work their magic and thicken the Kefir. We then refrigerate the Kefir which stops the fermentation process. It is then ready to enjoy! Kefir is delicious on it's own or you can add fresh fruit, honey or fresh maple syrup. It also makes a great protein shake when blended with a protein powder, fruit or peanut butter, fresh kale, or avocado. The combinations are endless. Goat Milk Kefir is great for digestion, bacteria to keep your gut healthy. Our goat milk is pasteurized and bottled weekly. It is available in Pint and Quart size. Plain and chocolate. Goat milk is very easy to digest and is considered the most closely related milk to a mothers breast milk. This is why many mom's who choose not to or cannot breast feed, bottle feed pasteurized goat milk to their babies. NOT AVAIALBLE AT THE MOMENT! 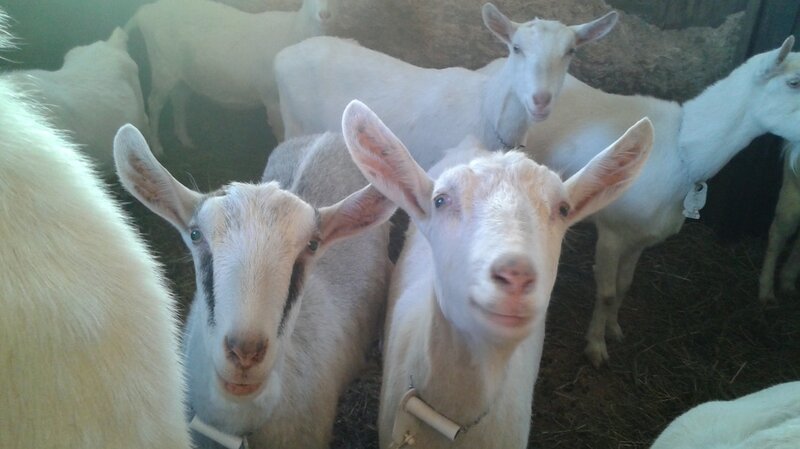 Our goat milk is delicious, with a hint of sweetness. And no it does not have an off taste like some people think!